Water contamination in turbine and other industrial oils can be a very serious issue and water testing is always a part of any lubricant condition monitoring program. Turbine oils typically are formulated to have high thermal stability, oxidation resistance, and excellent water separation. Lubricants available specifically for gas turbines or steam turbines are designed with specific additive formulations, but there are also many oils that can work with all different types of turbines. Gas turbines have the tendency to build up sludge and varnish whereas steam turbines may experience oxidation, foaming, and sludge. However, a concern of all turbine systems is water contamination. Severe water contamination can cause changes in the oil’s viscosity, accelerated oxidation, additive depletion, and decreased bearing life. Turbine manufacturers typically recommend a warning alarm limit of <1000 ppm. A new water calibration that measures light scattering due to the presence of water droplets is available on the FluidScan for the Industrial Library. The method was developed with water contaminated samples of several popular brands of turbine and gear/bearing oils for a robust universal calibration of industrial fluids ranging from a few hundred ppm up to 65,000 ppm water. 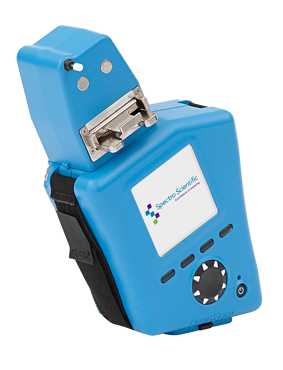 The measurement method, in which a small sample of industrial oil is homogenized and analyzed using infrared spectroscopy, is employed using Spectro’s FluidScan portable oil analyzer. The latest version of FluidScan software can detect total water presence as low as 300 ppm in turbine oils. The method provides an alternative to laboratory tests such as Karl Fischer titration when fast, simple, and reagent-free analysis is needed. 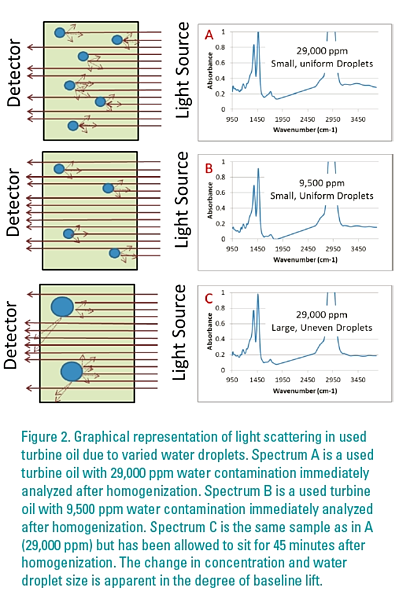 The new FluidScan method for analysis of water contamination in turbine oils is a robust, reliable method capable of providing immediate alert of severe water contamination. The largest contributor to the variation is the sampling. Hand-shaking is not sufficient for obtaining a homogeneous sample and reliable results for water measurement on the FluidScan. Immediate analysis at-site or the preparation of samples prior to analysis with a commercially available homogenizer is recommended for the best results. With best practice sampling technique, results correlating within 20% to Karl Fischer can be achieved. The new FluidScan water calibration provides accurate determination of the total water contamination in 90% of the industrial library for >300 ppm water in turbine oils and >1000 ppm water in other oils. If you would like to read our full app note about water in oil analysis, click here, or the button below.